Ulrich Herkenhoff was born in Osnabrück, Germany, in 1966. He took his first piano lessons at the age of six. At 14 came his encounter with the panflute at a concert given by the Romanian virtuoso Gheorghe Zamfir. Herkenhoff’s intensive autodidactic studies soon earned him a reputation as "the best non-Romanian panflute player". He stood out not only through his interpretation of classical music, but also for his work in the field of Romanian folk-improvisation. Following his flute studies at the Munich Richard-Strauss Conservatory with Jochen Gärtner, Ulrich Herkenhoff became the first German panflute player to be officially registered at the Advanced Class with final examination. He received special support for his studies of Romanian folk music from the Swiss ethnomusicologist and publisher Marcel Cellier, who discovered Gheorghe Zamfir. Together with Cellier Herkenhoff produced his first CD in 1990. Through his interpretation of classical music Ulrich Herkenhoff has inspired several contemporary composers to write music for the panflute. In 1992 he was awarded the Munich "Förderpreis des Gasteig Kulturkreises" (Sponsorship of Culture Group) and in 1996 with the Bavarian "Staatsförderpreis für junge Künstler" (State Sponsorship for Young Artists). Besides giving concerts Ulrich Herkenhoff is also acting in the pedagogical area; he is invited to national and international panflute seminars as an instructor since several years. In 1993 he inaugurated the first official class for panflute at the music-school in Bad Tölz, Germany. In the year 2000 he received the famous "Echo" award of the "Deutsche Phono Akademie e.V." for his CD "Symphonic Cinema", honoured as best classical virtuoso of the year. Since then Herkenhoff is also much asked for as soloist for cinema soundtracks. Among others he participated in the Oscar-winning music of “Lord of the Rings – The Return of the King" (composer: Howard Shore). He also contributed to the recording of Ennio Morricone’s soundtrack of "Fateless" (Roman eines Schicksallosen). Besides his concert activities Ulrich Herkenhoff is also acting in the pedagogical area and he is applying himself to publishing literature for panflute. 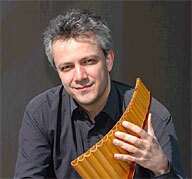 Since the winter semester 2007 he is teaching panflute as core theme at the Anton Bruckner University in Linz/Austria. All instruments he is playing are manufactured by himself.